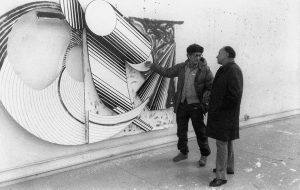 American minimalist, Frank Stella, at 80 remains a giant in the art world. His 50 or so series of artworks are inventive, risk-taking, dazzling and constantly challenge the notion of what constitutes a painting. Harry Seidler believed large buildings should display art. So it comes as no surprise that he collaborated with Stella to select dynamic, colourful paintings for the lobby of Grosvenor Place, that are dramatic and reflect his philosophy for the building’s architecture. It’s apparent in the plans of Grosvenor Place that Seidler was influenced by the 1967-71 series of Stella paintings, Protractor (Seidler owned one of the series). In this series, Stella plays with overlaying three protractors and exploring the variations of how they intersect; Seidler was fascinated by circular geometry as demonstrated by the form of the building’s tower that features two crescents with an elliptical central core. Seidler selected three artworks from Stella’s Cones and Pillars (1984-87) series. Monumental in scale, they are part-painting and part-sculpture. Stella created the works from honeycomb aluminium and painted them with industrial enamel to give a distinctive sculptural quality. He describes them as “mechanical drawings to create an illusion of volume and depth.” When viewed from any angle, their colourful shapes and projections provide a true 3D experience. The paintings, however, almost never made it to the massive stone walls of Grosvenor Place lobby. 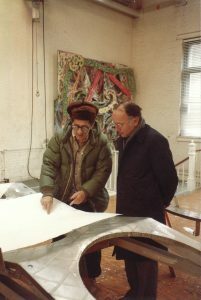 After lengthy discussion between Seidler and Stella on the best way to transport the paintings from New York to Sydney, they decided to ship them. After months of travelling in a sealed metal container, strong sun and rain damaged the pieces. Just moments from nearly being destroyed, the paintings were miraculously restored and saved, thanks to the rescue effort of a curator at the Australian National Gallery.